College students who participated in a self-administered intervention prompting them to reflect about their use of classroom resources had final grades that were higher than their peers, according to new findings published in Psychological Science, a journal of the Association for Psychological Science. Drawing from education research on self-regulated learning and evidence from social psychology on effective approaches to interventions, Chen and colleagues developed a brief exercise for students aimed at guiding their thinking about how they use learning resources. Across two different cohorts of students in a college statistics class, the researchers randomly assigned half the student participants to receive the intervention prompt; the other half received no prompt, serving as the comparison group. About 7 to 10 days before each class exam, students in the intervention group received a survey that asked them to write down the grade they wanted to get on the exam and rate how important it was to them to achieve that grade and how confident they were that they would meet this goal. The survey then prompted the students to think carefully about what kinds of questions the exam would probably include. After reflecting on the exam format, the students identified which of 15 available class resources they would use to study effectively. They elaborated on why each resource would be useful and described concrete plans for how they would use each one. After the exam, the students reported how effective they thought their studying had been and reflected on their performance, rating their agreement with statements, including “As I studied for the class, I kept monitoring whether or not the way I was studying was effective.” They also rated how useful they found each of the resources they had used in preparing for the exam. The results were clear: Students who strategically reflected on how to use their resources to learn effectively ended up with higher grades at the end of the semester, outperforming their classmates by an average of one third of a letter grade. And more reflection seemed to lead to better performance: Students who received the intervention prompt twice had higher final course grades than those who only received the prompt once. 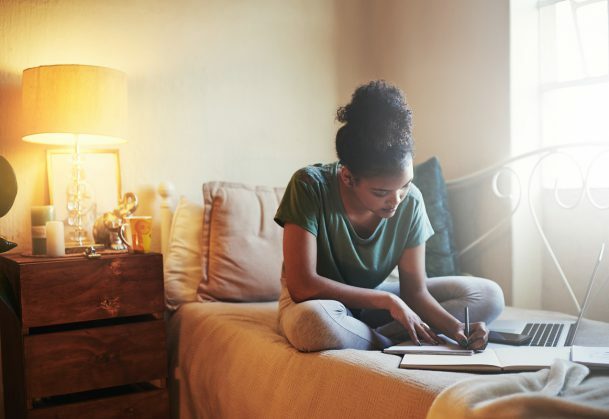 The more students self-reflected on their study strategy, the more useful they found the resources they had used, and this ultimately predicted their final grade. Using a greater number of resources overall didn’t seem to help – rather, it was using resources more thoughtfully that mattered for performance. Students who completed the intervention exercise also reported less negative emotion in relation to the upcoming exams compared with their peers, and they reported a greater sense of control over their performance, suggesting that students actually noticed the benefits of their strategic planning. These findings are especially intriguing given that the intervention itself did not require students a huge amount of time or effort. “Unlike instructor-facilitated, multisession, long workshops, this learning intervention is elegant in its brevity and empowering in its mode of online self-administration,” says Chen. Co-authors on the research include Omar Chavez of the University of Texas at Austin, Desmond C. Ong of Stanford University, and Brenda Gunderson of the University of Michigan, Ann Arbor. The study authors support open, collaborative science conducted in a mutually respectful and responsible manner. They have posted their data, code, and materials at http://osf.io/5fr3d. These materials are accessible by researchers and practitioners upon request. To request access, please complete and submit the request form at http://www.patriciachen.com/requestmaterials. The study authors want to work with researchers and practitioners to improve student learning and are happy to answer any questions about the materials.